MS Access file recovery is the proficient application to recover MDB file in minimal steps process, without any data loss. The demo version of Systools Access Recovery tool can be downloaded online and by using this version, you can get the preview of recovered items (Tables, query, relationships etc.) of access database but you cannot save the database on your system because saving option is restricted in demo version. For saving the files, purchase licensed key of MDB file recovery and get the complete recovery solutions. SysTools Access Recovery tool is a great MDB file recovery solution that helps to recover data from corrupt MDB files of MS Access. Are you worried due to MDB corruption and searching an MDB file recovery tool to recover MDF file contents from corrupted Access database? 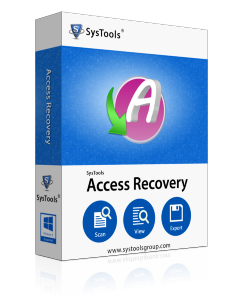 SysTools Access Recovery tool is an easy-to-use tool that any beginner can also use confidently, comfortably and successfully. Using this software does not require you to be a technical genius. Even scanty knowledge of the system is enough to understand the interface and use the software successfully to recover MDB file data from corrupted Access databases. Repairs MDB files : This Access file recovery software repairs corrupted/damaged Access database .mdb files. Repairs password protected files : The software can also recover Access database contents even if MDB files are password protected. Recovers data in original form : This MDB file recovery software restores tables and tables' data in the original form as they were present before recovery. Recovers all elements of MDB files : The software recovers primary keys and unique keys along with relationships. Shows preview of recoverable items : This MDB file recovery tool shows you the preview of recovered items. Supports almost all MS Access versions : Using this tool, you can repair MDB files of MS Access 2003, 2002, 2000 and 97. Supports almost all Windows OS versions : SysTools Access Recovery Tool successfully runs on Windows 98, ME, NT, XP, 2000, 2003, Vista, and now Windows 7. You can Recover Corrupt MDB File of Access database and recover MDB file content which can be saved to your system using the Full Version of SysTools Access Recovery software. Get a License for the Full Version. You can either buy the Personal License ($69) or the Business License ($189) for this MDB file recovery tool.